London (Reuters): Roger Federer’s career-long association with Nike appeared to be over yesterday as the Wimbledon champion walked on to Centre Court to open the defence of his title wearing a Uniqlo branded outfit. Gone was the Nike swish from his bandana and the RF logo that usually appears on his jacket was also missing. 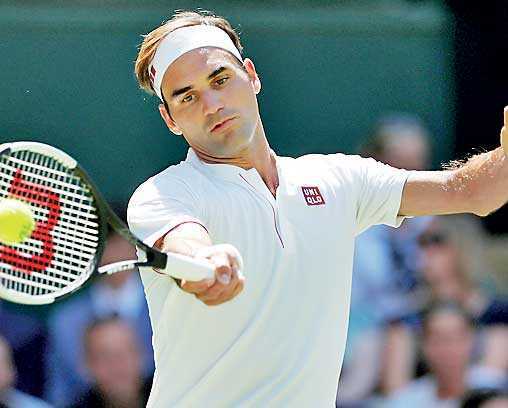 While thousands of fans around Centre Court wore baseball caps displaying the RF logo, Federer can no longer use it as the design is owned by the American apparel and equipment company, which had sponsored the Swiss during all of his previous record 20 Grand Slam wins. Federer, who was sporting a plain white bandana while playing Serbia’s Dusan Lajovic in the first round, has yet to comment on the switch to the Japanese casual wear designer. The top seed, however, was wearing Nike footwear, as Uniqlo do not manufacture shoes. Uniqlo issued a statement to confirm it had signed the Swiss as its global brand ambassador. While no financial details were revealed, media reported the new deal will be worth around $30 million a year, compared with the $10 million dollars a year agreement Federer had with Nike.During last month’s grasscourt event in Halle, Federer confirmed his deal with Nike had expired in March but he kept his arrangement with Uniqlo firmly under wraps until yesterday.On Sunday, he turned up at the traditional champion’s pre-tournament news conference at the All England Club in a white shirt, grey blazer and navy trousers instead of the usual tennis whites he has sported in previous years. The only logo on show was the purple Wimbledon members’ badge pinned to his lapel. Uniqlo also sponsor Japan’s number one men’s player Kei Nishikori. Former world number one Novak Djokovic had previously been sponsored by them. Nike sponsors Federer’s long-time rival Rafael Nadal as well as leading women’s players Serena Williams and Maria Sharapova.